IAS or IPS - two words that when attached to your name have the power to change your entire life. Every five lakh students write the civil service exam and if you are one of among them you have come to the right place. 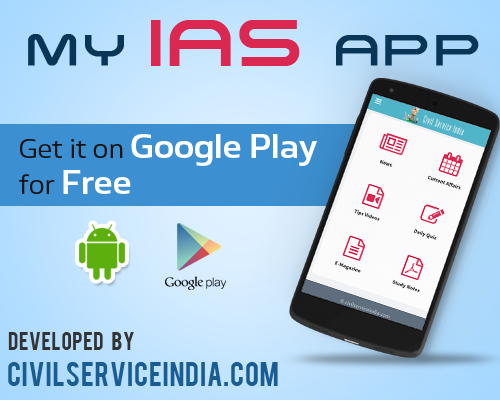 For IAS aspirants, Civilserviceindia.com has created simple yet powerful mobile app to keep updated with news and specially prepared current affairs and take preparation tips through our videos, all for free. This IAS app also has General studies quiz for practice on a regular basis and notes on major subjects and also carries our monthly emagazine, all of which can be subscribed for an additional cost. Civilserviceindia.com has been guiding students for over 18 years and with changing times we have upgraded and bettered how we help students prepare for the IAS exam. Our latest effort is to provide learning to students at their fingertips on their mobile phones. Apps are the order of the day due to ease and speed of use. We have built a well thought app for IAS aspirants. Our website has remained the most trusted website in civil services preparation zone and we are sure this app will be among the best apps for civil services preparation and we will soon be the most downloaded app for any UPSC exam preparation as this app provides tools for not only students appearing for the civil service exams but also for all the UPSC exams as the common zones of news, current affairs, news analysis and general studies quiz are part of the preparation of all exams. Take a look at our features and you will know. Need we say more? Download our free App for UPSC civil services exam.